Patience is a virtue, as Miikka “suNny” Kemppi showed in today’s qualifier matches for the PGL Major in Bucharest. His team, Penta Sports, was falling to the offensive push of Mouseports onto the B bombsite, so Kemppi patiently waited in the wings. 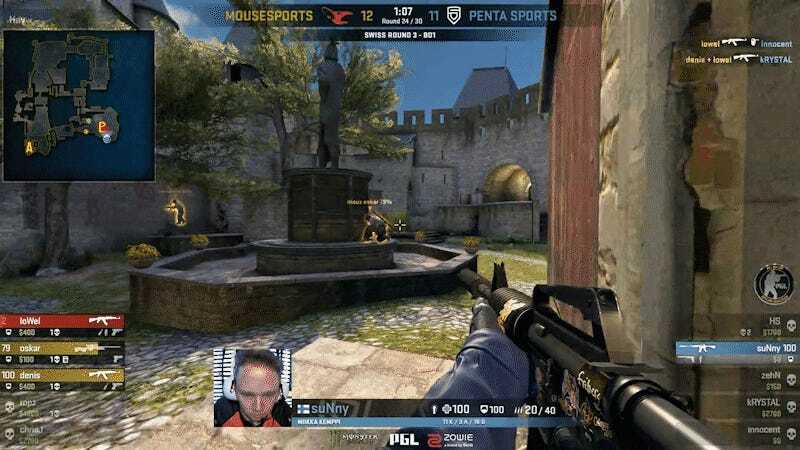 As one player set up the bomb and two fanned out to cover, Kemppi revealed himself and tacked up three quick kills to clutch the round out for Penta. From the spectator viewpoint, you can even see the hesitation in revealing himself too soon. A very patient and smart play from the Penta rifler to keep the game close at 12-12. The match would stay close until the final round, where Mousesports would wipe out Penta for the 16-14 win. The victory secured Mousesports’ top finish in the Swiss system, earning the team a spot at the PGL Major in Kraków. Penta, meanwhile, will have to play it out through more rounds to try and make the cut when games resume tomorrow on PGL’s Twitch channel.